We got a heads up on the upcoming animated adaptation of A Christmas Carol. 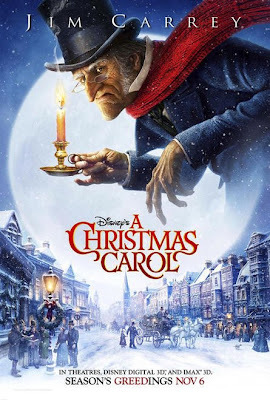 Yahoo just released the movie's poster that features Ebenezer Scrooge which will be voiced by the talented character actor Jim Carrey. This Disney animated feature is set to be directed by Robert Zemeckis. The movie is a retelling of the Charles Dickens classic about a man who hates Christmas but eventually changes when he meets several Christmas ghosts. A Christmas Carol is both written and directed by filmmaker extraordinaire Robert Zemeckis, of everything from Back to the Future to Who Framed Roger Rabbit to Forrest Gump to Contact to his past CGI movies The Polar Express and Beowulf previously. Jim Carrey stars at least four different characters, alongside of Gary Oldman, Robin Wright Penn, Colin Firth, Cary Elwes, and Bob Hoskins. Disney will debut A Christmas Carol in theaters everywhere on November 6th. wow something to look forward to!!! diba si jim carrey rin yung nga grinch who stole christmas? Uu nga eh. Pero di ko pa napapanood yun.